Quito's New Airport is now located in the town of Tababela, about 20km (12 miles) from the city. 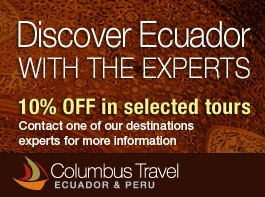 Even though it may not be located in Quito any longer, it will not take away from any of your city tours or free-time. The estimated time it takes to arrive to Quito from the airport is usually between 20-30 minutes, the same heading back. Airport hotels are a great option if Quito is your connecting flight to another Ecuador destination. If you are not planning to visit Quito, you can stay right there and not have to worry about finding transportation to return.